If you visited our shop recently, you may have noticed we have some new products on our shelves! They are mysterious and alluring and were created by our very own talented massage therapist, Kelie Micho. She calls them chakra sprays and we absolutely love them! Are you familiar with what chakras are or why they would need a luxurious spray? Chakras are energy centers throughout the body. There are 7 of them starting at the base of your spine and go all the way up to the crown of your head. From bottom to top, they are root, sacral, solar plexus, heart, throat, third eye and crown. Each chakra corresponds to a different area of the body consisting of nerve bundles and organs. For example, The fifth chakra, the throat, corresponds with the neck, thyroid, and parathyroid glands, jaw, mouth, and tongue. The chakras are said to be spinning wheels of energy that need to stay open and aligned because they are the things that keep us healthy, vibrant and alive. People believe that each chakra can get stuck or blocked, in which case the energy does not flow as it should causing an imbalance in the body, mind, and spirit. If a particular chakra is not aligned it is said you may experience certain physical or emotional symptoms or illness. What should you do if your chakras get stuck or blocked? Enter these beautiful sprays! So you may ask yourself how do the sprays support in keeping chakras healthy and balanced? Kelie designed a spray for each chakra. The sprays have a blend of essential oils that resonate with each chakra in keeping it in balance and harmony. The sprays can be used on the body areas associated with the chakras, but they can also be used as an overall body spray, room spray, during yoga or meditation. Overall they help bring the body, mind, heart, and spirit back into balance. They will make you feel refreshed, grounded, calm, and rejuvenated. 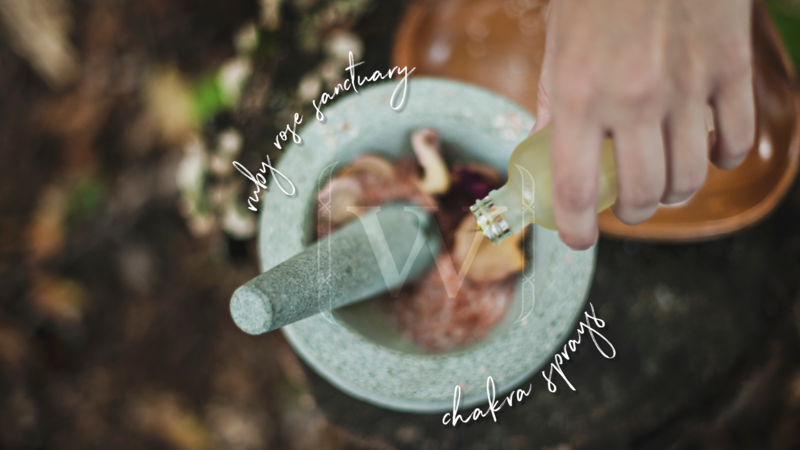 Kelie created the sprays and complimentary essential oil line to support her clients in her chakra balancing treatments that she provides in her own practice at Ruby Rose Sanctuary. Made from the highest quality oils and crystals, her vision was to create something decadent and nourishing for them to take home after their treatments to continue the process of healing and support them on their journey. These sprays are an excellent way to uplift your spirit in your own home and a fun way to add a bit of aromatherapy into your day. So which spray would you choose? Below is a description of each spray and how it can help maintain a sense of zen in your daily life. (Root Chakra) If you are feeling scattered, anxious, uncertain or ungrounded then you would want to choose “Home.” Containing balsam fir, frankincense, spruce, and eucalyptus, this grounding spray brings you down if you’re feeling worried. Frankincense is the key oil here as it calms the mental chatter and helps to deepen the breath. It also puts up a protective shield from flu and other illness. (Sacral Chakra) If you are feeling lack of creativity, finding it hard to express yourself or feeling sluggish then this is the spray you would choose. Vanilla brings out sensual intimate feelings with self. It enhances play and creativity. Pink peppercorn highlights this spray and helps if you have any type of body shame. (Solar Plexus Chakra) If you are feeling judgment for yourself and others, self-doubt, low self-worth or fear of being seen, this spray would give you the boost you need. Black pepper, lemon, and elemi are in this spray. It assists in really allowing your radiance to shine in how you show up in the world. It supports in cultivating the courage to stand in your power and to follow through with your heart’s desires. The key ingredient, Elemi which is actually a resin, supports you in taking actions in your life that allow growth. (Heart Chakra) If you are feeling out of balance, anger, grief, sadness, lack of compassion for self and others, resentment or heartache this spray is incredibly supportive. It contains rose essential oil which has the highest vibration of all essential oils. Using this spray will uplift you if you are feeling a bit off or having a bad day. It is a soothing and comforting spray that supports in uplifting your mood and vibration and in feeling forgiveness and compassion in yourself and others. (Throat Chakra) This spray is supportive in helping you expressing how you feel and communicating clearly with others. If you are feeling over critical, having a hard time speaking up in situations then this spray fits the bill. If you don’t feel heard or people tend to take advantage of you, this spray will support. It also supports manifesting your desires and sharing them with the world. Blue chamomile, cypress, and frankincense are in this spray. The key oil, blue chamomile supports in clear communication and is good to assist writers and artists in expressing their creativity. (Third Eye Chakra) Who doesn’t have a monkey mind every now and again or finds things to worry and stress over? This spray will support you in calming the nervous system and calming the mind. If you have trouble sleeping, this will help enhance your dream state. If you are someone who over thinks and suffers from headaches this spray will give you relief. (Crown Chakra) Sometimes we have a feeling lack of purpose in the world or unsure how we will serve others. This spray will support you in allowing a deeper connection to your authentic self, desires, and values. This is a great spray to use while meditating White lotus is the key oil in this spray. White lotus supports you in your spiritual growth and helps you to get unstuck. So which spray resonates with you? Home, Love, and Divinity are available to test out in our lovely shop. Kelie is one of our beloved massage therapists who has been with Wake for over 4 years. Practicing bodywork and massage for almost 20 years, her passion in life is helping people facilitate their own healing, her animals and consciously connecting with their beautiful essence and hearts. She also hosts yoga with chicken classes on her farm in Marshall, NC. In addition to working at Wake Foot Sanctuary, Kelie has a beautiful private practice in Marshall High Studios in Marshall, NC. To find out more information about her, her services and other products, you can visit, Ruby Rose Sanctuary. We hope you will visit the shop to try out some of these incredibly supportive and nourishing sprays. Let us know what you think by commenting below.